Shall we get some of the dodgy stuff out of the way right at the very beginning so we can just spend the rest of this review freaking out over how great this episode was? Sounds like a plan. As nice as it was to see three Stark children sharing the frame - and in Winterfell, no less - this season is kind of dropping the ball in terms of exploring said Stark children. Arya and Sansa's reunion is frustratingly hollow, only really evoking emotion by doing the bare minimum of having them hug each other and smile. Game of Thrones has made a comeback in terms of strong dialogue pieces this season, why not let the two Stark girls be a part of that? Let them sit down, let them talk about what they've been through. Instead, both Arya and Sansa's journeys are dismissed with "It's a long story" and it's tough not to feel shortchanged by it all. It was all very surface level, never really using the characters' separate arcs to attempt to define who they can be to each other now. Thankfully, the Winterfell set sequences improve drastically once the Stark children split up. I found Arya and Brienne's training sequence surprisingly effective, which is impressive on the show's behalf considering that if asked to list my three least favourite characters on this show, both of their names would be mentioned. There's both an energy and a homeliness to the sequence, it takes Arya and Brienne's personalities and narrative arcs and lets them come out during an almost wordless training session. Sansa watching silently from behind adds to the scene more, it evokes memories of way back in the show's pilot, with Ned and Catelyn watching Jon and Robb train Bran at archery. Littlefinger's presence in the moment can't help but distract, but the scene works far better than it has any right to. We only checked in with Cersei and King's Landing briefly this week, but the moment was solid. Cersei discusses the Crown's debt with Tycho, assuring him it will be paid in full and just casually dropping in the fact that Qyburn is in the process of recruiting a new, currently unheard of army to join the Lannisters' side during the upcoming war. It highlights an element that Game of Thrones is seriously excelling at this season: the repeated shifting of the war dynamics. Going into this season a big win for Daenerys seemed inevitable, but now the show has worked to level the playing field, to bring Cersei back into the game. The lack of discussion over her actions in the last season finale still feels awkward - I mean, a Queen did blow up her own Sept and kill hundreds of people - but I think I'm willing to forgive the show for focusing more on the future than the past. Just a bit more dialogue on the subject would have been nice, a way to draw Cersei's former actions into the present war more effectively. On the other side of the war, though, things are considerably less quiet. Jon takes Dany into the caves beneath Dragonstone to show her the mountain of Dragonglass they'll be mining, but he also presents her with cave drawings depicting the Children of the Forest and the First Men coming together to fight the White Walkers, insisting that the two of them must do the same thing. Dany's mentality remains unchanged though, she tells Jon that if his people chose him as their King then they will still follow him should he bend the knee to her. Game of Thrones is exploring the moral battle between Jon and Dany brilliantly well, a dynamic we've waited years to see and one that isn't disappointing. It's also giving Emilia Clarke arguably her strongest material to date, and her performance is emphasising this. Clarke has always been one of the show's strongest performers but there's a newfound confidence to her this season, an assuredness to her dialogue and a power to her body language that's working to pull Daenerys back to her most interesting self. We eventually return to Jaime on the Rose Road as he prepares to return to King's Landing. After a brief conversation between him, Bronn and Dickon Tarly about shitting yourself in battle, "The Spoils of War" throws itself head first into one of the biggest battle sequences Game of Thrones has produced, and that's saying something. A horde of Dothraki charge towards Jaime's army, Dany herself soars into battle on Drogon's back as he lights up the battlefield in a blaze of fire. The scene is thrilling, and superbly tense, but what makes everything here so effective is the way it turns a slaughter into a battle of morals, both for the characters and the viewer. We've seen large scale battles before - Hardhome, the Wall, the Battle of the Bastards to name a few - but never before has Game of Thrones pit fan favourite characters against each other. I'm not exactly the biggest lover of Bronn's presence remaining part of the show, but I have to confess that when Drogon flew towards him as he fired that crossbow, I didn't know what outcome I wanted. The scene throws you into a frenzy of confusion, but unlike the shorter battle on the Greyjoy fleet two episodes ago everything here is shot and edited with clarity. First time Game of Thrones director Matt Shakman demonstrates a remarkable talent for action film making, contrasting giant sweeping shots of Drogon igniting an army on fire with tight close up moments of Bronn on horseback. The battle takes on a multitude of perspectives - there are POV moments from Jaime, Bronn, Dany, Drogon and eventually Tyrion too, not to mention countless unnamed soldiers - but brings them together effortlessly, creating something as frantic as it is focused, as engulfing as it is intimate. I don't think Dany's field of fire quite tops the horror-esque slaughter of Hardhome or the wholly unpredictable nature of Blackwater, but that's a tough crowd to compete in. This is brilliant, dizzying stuff from Game of Thrones. And, much like how I mentioned earlier, it shifts the dynamics again. The show is refusing to sit still this season, and it's a thrilling feeling. 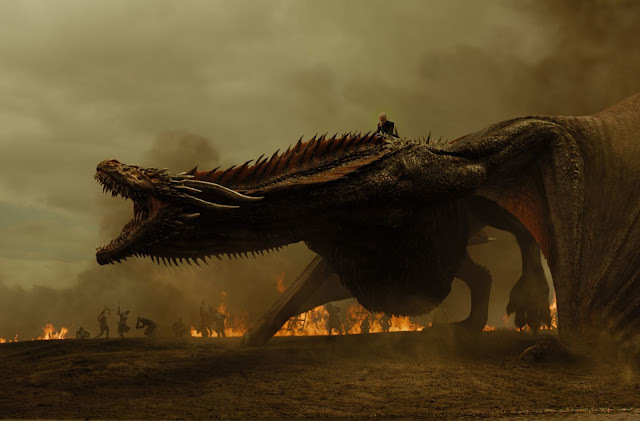 The battle ends with Jaime charging towards Daenerys while she cares for a downed and injured Drogon, but before he can reach her Drogon comes to her defence. Jaime ends up knocked into the river, his heavy armour sinking him to the bottom and the episode fades to black before we can discover his fate. It should feel like a cheap cliffhanger, but the episode closes on such a high from the preceding fifteen minutes that I'm willing to reserve judgement for now. "The Spoils of War" heavily implies Jaime's death here, and I'll be frustrated if it uses the climax of such a terrific scene as a laboured "is he or isn't he dead" cliffhanger, but for now I'll just sit back and watch that battle over and over again, and marvel every time at how beautifully constructed it is without ever appearing so. Arya having to debate with guards to get back into Winterfell was a really nice parallel to her doing the same thing to get back into King's Landing back in season one. A clever way to bring Arya's journey to a close now that she's returned home. Dany and Missandei's little talk catch up about their personal lives might be the most forced dialogue Game of Thrones has served up all season. I'm all for fleshing out characters away from the battlefield, but please, not like this. Jon really is in a morally peculiar place right now. It only seems like yesterday he was begging Mance Rayder not to give in to pride and to help his people, and now Dany is asking the same of Jon. The show is handling these two brilliantly, perfectly exploring both sides of their argument without giving in to cheap ways out. I feel like they're beginning to understand each other better now, but I'm really glad the writers are taking this development slowly. Jon greeting Theon at the shore of Dragonstone was gleefully tense. I really didn't know what would happen there. It also combines nicely with Tyrion watching Jaime in the battlefield, quietly pleading for him to flee and survive. Both involve families turned into enemies, whether or not intentionally or for the right reasons. It'll be really interesting to see Jon and Theon's dynamic next week. We're still yet to see any White Walker action this year, but looking at next week's episode title makes me think we aren't far off.